Summary Four bay RAID 5 class NAS with one Gigabit Ethernet port powered by dual-core Realtek CPU. 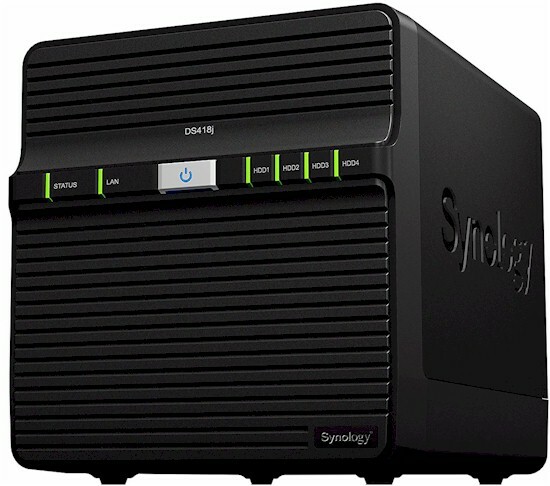 If you're in the market for an entry-level 4-bay NAS, Synology's DS418j is the latest addition to our NAS charts. The DS418j appears to be a replacement for the DS416j, which I reviewed earlier this year along with the DS416. Although the DS416j no longer appears in Synology's product lineup, it's still readily available online. Synology's "j" series NASes are entry level products aimed at the Personal/Home market. Models without a suffix are part of the Value Series targeted at the Home/Workgroup market. The DS418j looks almost identical to its predecessor, the DS416j. However, there are three major differences. The DS418j is powered by a Realtek dual-core CPU vs. dual-core Marvell CPU. The DS418j ships with 1GB of RAM - double the amount in the DS416j. Finally, the DS418j features two USB 3.0 ports. The DS416j has one USB 3.0 and one USB 2.0 ports. For this review, it seemed logical to compare the DS418j and DS416j. But I also decided to include the QNAP TS-431P in the comparisons, as it's currently priced within a few dollars of the DS416j. I also thought it would be interesting to see how the three NASes, each with a different manufacturer's brand of dual-core CPU, would compare. The chart below, generated from the NAS Finder, shows the basic differences among the three NASes. A complete comparison of these three NASes is here. You'll note that both Synology NASes have a single Gigabit Ethernet port, but the TS-431P has two Gigabit Ethernet ports that support load balancing, failover and link aggregation. The callouts and LED indicator key chart below shows the front and rear panel layouts for the DS418j. The single Gigabit Ethernet port indicator is on the front panel and indicates only link/activity/no network. The DS418j has two USB 3.0 ports - both located on the rear panel. The DS418j does not support hot swappable drives. Like its DS416j sibling, drives are accessed by removing four thumbscrews and flipping down a rear panel. The disks are secured in disk trays with screws. You can download the Hardware Installation guide here. Once the metal case and drive trays were removed, it was relatively easy to get a photo of the DS418j's board shown below. The Realtek RTD1293 processor SoC and Gigabyte of onboard RAM are covered by a metal plate that is coupled to the heatsink above it via thermal pads. No datasheet for the RTD1293 was to be found. But we're guessing it is a feature-reduced version of the RTD1296 described in this article. The platform is based on a 64 bit ARM53 core. Gigabit Ethernet PHY, USB 3.0 ports and two SATA ports appear to be on the SoC. We found an ASM1061 two port SATA controller (upper right corner of the photo) for the other two ports.
? 512 MB Macronix MX30UF4G18AB ? The DS418j drew 19 W with four of our stock WD Red 1 TB (WD10EFRX) spun up and 9 W in power save mode with the drives spun down. By comparison, with the same complement of installed drives, the DS416j drew more power (27W) in active mode and slightly less power (7 W) in power save mode. In active mode, over the course of a full year, that amounts to a 70KW saving. Fan and drive noise was rated very low with no noticeable fan or drive noise. For RAID 5 rebuild, there was no option to skip a bad block check. RAID 5 rebuild time took ~ 3 hours for the parity consistency check for a 4X1TB array. All of Synology's current NASes operate using DiskStation Manager 6.1. DSM 6.1 provides a common set of features and a consistent user interface across all of Synology's products. Of course, some higher end products support enhanced features, such as the BTRFS filesystem and real-time transcoding that aren't supported on J Series and Value Series products. If you want to explore the features of the DSM 6.1 operating system, Synology has an online emulator for DSM 6.1. This link will give you a 30-minute session to explore the user interface. Of course, some admin features are disabled in the demo. You can also browse through the videos in their Knowledge Base, or download the DSM 6.1 User's Guide. The screenshot below shows the DSM 6.1 control panel along with the performance widget running on the desktop. This was created from the online DSM 6.1 demo. DSM 6.1.3-15152 Update 1 firmware was loaded onto the DS418j and performance tests were run using the Revision 5 NAS test process. All tests were run using Western Digital Red 1 TB ST1000VN001 (x4 SNB supplied). File copy Write and File Copy Read results were consistent across all RAID levels (RAID 0, 5, & 10) for all three NASes. All results were above 100 MB/s with the exception of the 94.9 MB/s result turned in by the DS418j for RAID 5 File Copy Write performance and approached the theoretical limit of single client testing on a single Gigabit connection. On the NASPT HD playback & Record tests, as well as on the NASPT 4x HD Playback tests, surprisingly, the DS416j edged out the DS416 for all RAID levels. What's surprising is how close the results were for all three NASes. Of course, there were some exceptions such as the lower NASPT directory copy performance for all raid levels for the DS416j. We'll also see those differences in the NAS Ranker category performance comparisons below. Neither the DS418j nor the TS-431P has USB 2.0 ports, so no USB 2.0 backup tests were run. For the USB 3.0 backup tests, the DS416j underperformed both the DS418j and the TS-431P by a significant margin. Surprisingly, however, the DS416j edged out the DS418j and the TS-431P on the network backup tests. Using the NAS Ranker, I filtered for RAID5 class products, test method 5 and sorted by ascending price. The chart below shows the Total NAS scores for the eight least expensive four-bay NASes. The DS418j had a very respectable rank of #2 out of 16 products tested in the chart. The QNAP TS-431P and the Synology DS416j ranked #4 and #5 respectively. None of the three least expensive NASes had Total NAS ranks that came anywhere to the three compared NASes indicating that all three fared well from a price/performance perspective. Looking at the subcategories, the DS418j had category wins for the Read Benchmarks, Mixed Read Write, and Video categories. It tied for #6 ranking with the DS416j for Backup and tied for #4 with the TS-431P for iSCSI performance. The only category where the DS418j fell short was its #4 ranking behind the #1 ranked TS-431-P for the Write Benchmarks category. It really is unusual to see three NASes to turn in benchmark performances that are so close in so many categories. While the #2 Total NAS ranked DS418j holds a slight performance over the #4 ranked QNAP TS-431P and the #5 ranked Synology DS416j, chances are that you'd never notice the differences in real-world use. In addition to performance, the DS418j and DS416j are very similar as neither has hot swappable drives and both require case disassembly and tools to install or replace disks. The QNAP TS-431P has hot swappable disks, three USB 3.0 ports, and two Gigabit Ethernet ports and is the least expensive of the three NASes compared. No matter which NAS you end up choosing, aany of these three will give you good performance at an affordable price. And, if you're a bargain hunter, keep an eye on the pricing of the DS416j. Since it has been discontinued by Synology, you might find one with close out price, making it the best choice for you.